In wintertime little children have a whole new world of treats to look forward to. There are the hours spent sledding on the bunny hill and the times when one tries to catch snowflakes on ones tongue. There are snow angels and snowmen to make and being pulled on dog sleds. There are those lovely times when one toasts oneself in front of a fire in the company of ones favorite people. Such cozy times indeed. 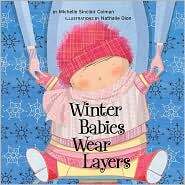 In this thoroughly warming little board book we get to see winter days from the point of view of very young children. We never really see the grownups – except their arms, legs, and feet – but instead we focus on the experiences of little children. We see their good moments and their bad ones. We see their excited times and their quiet ones. With unique and quiet lovely artwork and minimal text, this is very special title which little children and their grownups are sure to enjoy.